Here at Click & Carry, we love to find stories of ways that Click & Carry makes your life easier. When we can make a person’s day one iota simpler by using Click & Carry handles at the grocery store or picking up sports equipment, we get REALLY excited! On that note, please meet Maria who we met at a grocery store parking lot. We showed her how Click & Carry worked and showed her how it could just make her everyday life easier…and let’s just say she got excited too. For your very OWN CLICK & CARRY, CLICK HERE! We adore animals here at Click & Carry. We love to snuggle, cuddle, and play with animals especially when they carry items with their Click & Carry handles. Our handles give these pets the ability to help out with grocery shopping, helping to donate to the Salvation Army, or just carrying their favorite beach toys. Here are some ways that your pets can use Click & Carry in everyday activities. Yes. When your dog carries his beach bag with an @clickandcarry while looking for THAT perfect beach spot, all you want to do is be his videographer. Sometimes you just need an extra helper to help you with errands and grocery shopping. We adore Kole who likes to take charge while helping out with daily activities. When you’re super stressed from all that holiday shopping, wrapping, and traveling, there’s nothing like an adorable canine to help you. Or be like Kole here who uses his carrying skills to help donate to the Salvation Army. 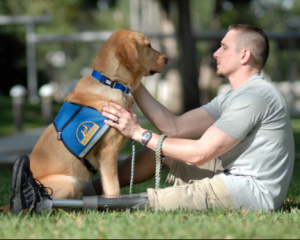 We’re proud sponsors of Canine Companions, a non-profit organization that enhances the lives of people with disabilities by providing highly trained assistance dogs and ongoing support to ensure quality partnerships. For your very own Click & Carry, CLICK HERE or buy on AMAZON PRIME. The New Year is a time when we can re-set and renew from the past year and see what we can improve and how we can go about doing so. In 2019, the team here at Click & Carry would love to inspire you to do more with less effort. Why make things harder on yourself when you can just make life easier with products like Click & Carry? Here are some fun facts about the Click & Carry. Each handle is divided in the center with a twisting column. There are two identical side cavities to hold your bags or cargo. Each side cavity can carry up to 40 pounds and has a comfortable padded gel grip to carry your heavy loads without an issue. So, every time you have to go on a grocery run, buy too many items at Target, or need some help carrying sports equipment to the game, just grab your Click & Carry and make your life easier. Here are some more ways Click & Carry can help you in your daily life. Yass! Not only does weightlifting help you to increase muscle mass and burn more calories at rest, but it can help you have a better posture and even improve your bone mass. With Click & Carry, you can even distribute the weights you carry with ease and precision. Yes, you can order everything through Amazon, but if you still grocery shop in person, why not make it easier for yourself by using Click & Carry? Don’t make more than one trip. Just put your grocery bag handles into the Click & Carry, twist, and click it into place. Whether you’re having a dry January or you’re a card-carrying member of the wino club, Click & Cary can help you lug all your wine back to your home. Here’s a quick tip: Put wine bottles in individual bags and carry them with ease without worrying about breaking the bottles. And to get your hands on your very own Click & Carry, click HERE. The days where women had to do all the housework and child rearing are no more as more parents are equally splitting up household responsibilities. Being an equal partner in the home means sharing in the unsexy aspects of coupledom including grocery shopping, cleaning, and making sure the kids get to and from their activities in one piece. What can help Dads the most are devices such as Click & Carry that get the job done in the quickest possible way. Let’s be real. Wrangling the kids while grocery shopping and making sure that your son/daughter didn’t throw eight packages of cookies in the cart isn’t exactly easy. But at least you’ll know that bringing the groceries to and from your home is made easier with the Click & Carry. Just put the bag handles into the Click & Carry handle, turn, and click. You’ll be able to easily grip your bags and still have an extra arm to lock the car door and get the kids into the house. Whether you’re painting the garage, fixing the car, or just doing smaller household repairs, you may need to head to your local hardware store for supplies. With a Click & Carry, you can easily put heavy items such as paint cans or wood blocks onto the Click & Carry handle, and pick them up in a snap. Did I mention no unsightly marks on your hand from the uncomfortable paint can handles. It’s that time of year again. Yes. Whether you’re riding the slopes on the powdery real stuff or you prefer the icy hills of man-made snow, it is ski/snowboarding season. 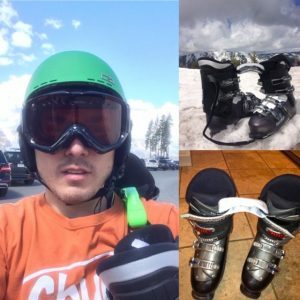 With Click & Carry, you can easily go hands-free and put your ski-boot laces into a Click & Carry handle, and just throw it over your shoulder. Now you have an extra arm free to hold your skis/snowboard and an extra cup of hot cocoa. Whether you live in Southern California or Hawaii, surfing is still one of the ultimate endurance sports. You’re going to need that extra core strength to ride that killer wave coming your way, so why not save that energy by using a Click & Carry? Just put the board handles into a Click & Carry and use your shoulder strength to pick it up. Easy peasy. The dreaded Target run. Dads know this just as well as moms. You go into a Target for toothpaste and somehow leave with four extra bags filled with…STUFF. Well, you actually CAN plan for such situations. With Click & Carry, you can throw the plastic handles into a Click & Carry handle and voila…you can easily pick up all your stuff. Easily. Quickly. Efficiently. For 25% off your own Click & Carry, click on this link and enter ‘Holiday25’ at checkout. Are You a College Student Tired of Carrying ALL the Bags? Are you a freshman who came to campus carrying WAY too many bags? Did you parents buy you an entire aisle at Target just so you can fill up your dorm room with various items you probably won’t even use? Well, here are some ways that college students like yourself can use Click & Carry to help your better navigate all your bag usage during your college experience. If you’re one of the many students at a campus where you’re able to pillage some cereal from the dining hall, bravo. You also might be one of the students who go on their weekly journey to a local grocery store/Target to get your essentials. But who needs the extra drama when you’re excited to down those ramen noodles while you’re texting, watching Netflix and writing your Humanities paper? Just put your grocery bag handles into your Click & Carry, flip over your shoulder, and glide back to your dorm room. Yes, you can Boomerang yourself doing so. College is the place where you figure out who you are, what you stand for, and gosh darn it, what clubs/activities you’d like to be involved with. Now, if you’re down with student government, the digital newspaper, or even improv, you will soon find out that clubs like to have meetings. Monthly meetings. During meetings, these clubs like to provide free food and snacks. The best part about these meetings is that there’s always leftovers for broke college kids to take back to their dorm rooms. Why not use a Click & Carry to make carrying those bagged chips and extra soda bottles a breeze? Laundry day. For many college students, college might be the first time that they ever have put their dirty clothes into a machine. If that’s the case, why not use a Click & Carry to make this dirty and heavy process way easier? Just put your laundry bag handles into the convenient Click & Carry handle, twist, click, and just flip it over your shoulder. You won’t get those nasty rope burns and you can look way cooler than those other students on your floor who use their hands. Rock out Ski & Snowboarding Season with Click & Carry! Winter isn’t just about working out in heated gyms and places where controlled temperatures are the name of the game. For outdoor sports lovers, winter is the time of the year when snow, sleet, and freezing rain mean one thing…ski and snowboarding season is here! Whether you love that powdery soft snow or that icy stuff that only comes from expensive snowmaking machines, you’re probably excited to be spending your weekends and the holiday season on a mountain somewhere. Here are some ways that you can use Click & Carry to make your outdoor sports season even more enjoyable! You’re already bundled up with your jacket, ski outfit, and used the facilities before taking the plunge. Alas, now you need to carry your equipment up to the ski lift. It’s heavy and you don’t want to deal with it. Well, you’re in luck. With Click & Carry, all you need to do is put the equipment handles onto the Click & Carry handle, sling it over your shoulder and what you get is this. Ease. Are you going with a bunch of your friends to a weekend at the cabin? Do you have tons of bags that you need to somehow transfer from your vehicle to the cabin? Why depend on multiple trips from your car to the cabin? With Click & Carry, you just need one trip by adding your grocery bag handles to each groove on your Click & Carry. Yup. You can also use Click & Carry to Carry Your Snowshoes up the Mountain. Our Click & Carry inventor, Kim Meckwood, demonstrates here on her recent visit to QVC. Happy Winter Sports Season from all of us at Click & Carry! How To Find the Best Holiday Gifts! Have you frozen your credit card yet? By that, I mean, have you put your credit card into a cup of ice and put it in your freezer so you don’t spend it? Now that #Black Friday and #CyberMonday have come and gone, you’re finished with your holiday shopping right? We’re just kidding. We know that you still have a bunch of holiday gifts to purchase for Christmas, hanukkah, Kwanzaa, or dare we say it, Chrismasakkuh? But don’t fret, here are some tips to take advantage of those last minute holiday deals. We’re not talking about that sweet stuff that you put in your tea. We’re talking about Honey, a free browser extension that automatically finds and applies coupon codes at checkout for over 30,000 shopping sites. You can use it on Amazon and various other e-retailers to get the best possible deal. Were you too exhausted to deal with the plethora of Cybermonday and Black Friday sales coming your way? Did your credit card endure a bit too much use this past week? Don’t fret. Most retailers know that you will be online this entire month looking for the best deals so most of these deals will still be available for us. Including us. Yes, here at Click & Carry, we have 25% off all Click & Carry handles using the code ‘Holiday25.’ Moms, friends, co-workers will LOVE them. Trust us. Do you really need another scarf or a mug that you will never use? Or perhaps a random skin cream that you will give you a rash? The answer is a resounding now. Why not gift someone with something that they will actually use? Try a bottle of wine, an Amazon or Trader Joes gift card, or a Click & Carry that will help you carry all those holiday goodies. Yes, this is still the truth. Despite the idea of wanting to give extravagant gifts, sometimes the best gifts are small, inexpensive and come from the heart. Why not gift a picture album like Chatbooks or perhaps useful items like Click & Carry into a little gift bag with additional helpful household goodies. Like we always say, ’tis better to have given a gift that will be used than a gift that will be re-gifted immediately or put in a closet to be re-gifted next year. © Copyright 2017 Click & Carry. All Rights Reserved.